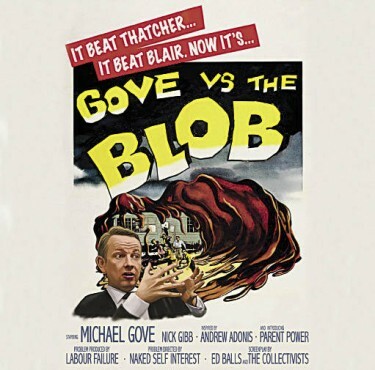 Other commentators explicitly named the ‘Blob’ as being the cause for Gove’s dismissal. There are varying accounts as to who coined the term and what the Blob actually is. In the Daily Mail, Richard Littlejohn described the educational establishment as the ‘Blob’ that “have debased standards and betrayed generations of schoolchildren since the Sixties. Social engineering and ‘self-esteem come before actually teaching children to read and write” (The Daily Mail, Friday 18th July 2014, p. 19). In the Evening Standard on 16th July 2014 Matthew D’Ancona had a different perspective on the Blob: "As Education Secretary, he was unapologetically on the side of the pupil against the remarkably robust vested interests in the schools system that, borrowing US jargon, he called 'the Blob'… Whether or not it was Lynton Crosby, Cameron’s election strategist, who wielded the cosh — as many of Gove’s supporters believe — polling data revealing hostility towards him certainly played its part in the move. This is the most depressing aspect of the whole saga. Imagine if Margaret Thatcher’s privatisations had required the green light of opinion polls — our utilities would still be nationalised." In the TES, teacher-blogger Tom Bennett claims Toby Young invented the term: "Despite his pantomime villain status, Gove was one of the most effective ministers in my lifetime, and certainly the most effective education minister, by several barometers…One of Gove's most accurate assessments of the landscape was that a reactionary hegemony existed in education (which Toby Young defiantly characterised as The Blob – he would never use a toothpick where a toffee hammer would do), which had established both an orthodoxy of discourse and ideology, and a method to replicate itself indefinitely. His utter, damn-your-eyes disregard for popularity and kow-towing to the gatekeepers of convention made him a revolutionary much in the mould of his Bolshevik inspirations…"
For Toby Young, the Blob is the “anti-reform” brigade who include LSN founders Melissa Benn, Fiona Millar as well as the Socialist Workers’ Party, the Anti-Academies Alliance, and the NUT. According to Conservative Home, I’m a member of the Blob, although I’ve been lukewarm at times in my support of the unions, helped my son’s school to achieve academy status, and I’m not a teacher-trainer. My crime? For daring to say that free schools will fuel social segregation. Gove himself fingered the Blob as the teacher-trainers in the universities who are supposedly motivated by Marxist ideology. Gove in turn took his cue from cue the former inspector of schools, Chris Woodhead, who shared Gove’s dislike of academics who espoused “trendy teaching methods”. Gove became very unpopular with teachers. A YouGov reported this year that, where the Conservatives had been one point ahead of Labour in 2010 with teachers, under Gove's watch they had fallen 41 points behind. This is an excellent piece, Francis. I agree with most of it, although I fear I'm even less forgiving of Gove than you are. I don't have a blog, I just rant BTL on the Guardian and on twitter, but my thoughts on Gove are BTL on the linked article. Fundamentally, I read another journalist in another allegedly centre-left newspaper, praising Gove for policies which have no evidence behind them, and snapped. Hence the ranty tone. I am so pleased this wrecking-ball-disaster of a man has gone. Hopefully after 2015 he and his fellow travellers in the "glob" (like it!) will be unable to damage our education system further. Thanks for your kind words. I've read your comments on the Guardian blog now, which are really incisive. I think you're right about the media and Westminster bubble Gove existed in. It's interesting to see how mystified right-wing commentators are about his dismissal: they just don't get it, and I think they find it troubling because they have to come to the conclusion that no one was persuaded of their arguments about the marvels of Gove. I think this makes it a parable because it shows just how out of touch they are. Someone like Tom Bennett is supposed to the voice of "common-sense" teachers in the TES and yet I've yet to find another teacher in the state sector (as opposed to virtual catfish ones) that has a good word to say about Gove. And quite rightly, he cut our pay, pensions and seriously eroded our working conditions. The fight now, I think, is not about Morgan. She's clearly been sent in with an electoral brief, basically a few nods to the Tory heartlands on possible new grammar schools, and just not being Michael Gove to try and bring ex-Tory teachers (yes, there were some) back into the fold before 2015. The problem is that Hunt, and most of the Labour education team, belong in that same bubble. They are still enslaved by Gove's diagnoses and prescriptions, and still use the same tired and irrelevant clichés about "freedom from LEA control", "driving up standards", and of course endless reinforcement of the incredibly damaging Cult Of The Leader in our schools. I think what I find particularly frustrating, is that they are so deep into the glob, that they cannot even look beyond it. Policies such as local accountability for schools are overwhelmingly popular, and academy chains rightly viewed with great suspicion. Yet Hunt insists there can be no return to local accountability. Why ? Because it has become universally accepted in the glob that LEAs are bad, and academy chains are good. They will not listen to the profession or the practitioners, but remain isolated in that Westminster echo chamber, the ignorant privately educated politicians and the ignorant privately educated media reinforcing each others' prejudices, like a Montanan religious cult worshipping Guru Adonis. The fight is to bring reason, evidence and sanity back to Labour education policy. Somehow, we have to turn it from being entirely designed to please other members of the glob, to being entirely designed to serve the best interests of students. I haven't a clue how, but a good start I guess would be for us all to continually remind Hunt that the reason teachers and parents loathed Gove was not just because he was a disreputable weasel, but because he was WRONG. Otherwise, he will slip out of the picture, and some less catastrophically confrontational globulites will simply slide in and continue to pull apart our state education system . Both this and the DisillusionedLurker comments are excellent. For me Gove is the best example of the disconnect between the media and the rest of the country. Anyone outside the london media bubble could see just how repellent Gove is in person (I.e. In print and on tv and radio) and how unpopular his ideas have been, nearly from the beginning, with not just teachers but parents as well, yet until very recently the unequivocal media view on him was "the politest man in Westminster, genuinely committed to improvements in education,veto etc". This despite his actions from day one being a series of PR stunts with almost no overall guiding principles and nothing adding up at all (the best example of this being his personally -and it obviously was him - rewriting the curriculum in many subjects while also allowing every school he liked to bypass the curriculum entirely - if nothing else a ridiculous waste of resources). Also remember his cack handed attempts to cut costs, selling off playing fields and cancelling buildings. At the time the media praised this, but from the start that was a serious miscalculation, especially because he didn't actually manage the due budget well at all (e.g. spending 9mil on a building for Toby Young). He loudly proclaimed his Blairism (which got thick Blairite journos onside) but learned nothing from Blair's actual career, only from his autobiography (Blair generally picked fights he could win, and pushed through reforms that were usually popular - Gove, on the other hand, picked fights with everyone regardless of whether he could win or even cared about the issue, and pushed through reforms which even early on were not very popular. Nobody actually wanted free schools and the insistence on unqualified teachers might be part of some weird point about independent schools, but sounds awful to yer average voter. And can we now please put the "polite" thing to bed? Being polite to journalists seems the easiest way to convince them you are something other than hateful, but his statements and actions were the absolute opposite of polite. In the House after the Syria vote he was calling his opponents Nazis. He is not polite. The problem with him is that he isn't actually very clever or talented. He managed to convince nobody of the value of his ideas because when push came to shove, he couldn't debate or make a convincing case - all he can do is call people names,and the only people he listened to about education were the same (Cummings). That's because he is an opinion journo, for which the only requirements are a thick skin and a colossal sense of ones own brilliance. And those are the only two real "strengths" he has. A fantastic article, Francis. This whole grim episode has revealed even more clearly the extent to which the media set the frame of our entire public discourse. Dissent only happens among the little people now; at least years-long cries of collective horror still occasionally have an effect. Will Mr Gove and the conservative party take it on the chin when his sponsored academies see a dramatic drop in GCSE outcomes this year, due to his removal of early entry and belief that only end of two year course exams is the way forward? I don't think anyone's won anything. We may not know much about the new SoS but we know plenty about Nick Gibb. I'm also reminded of our conversations here in 2012 where I was advising Ricky that Michael Gove would make a good whip. I can find traces of that on google search (search e.g. for localschoolsnetwork gove whip Rebecca ricky and go down a few results) but can't find any of the actual conversations. I'd be amused if anyone can find them! That's the one - thanks, agov. Rebecca's comment is dated 27/8/12 at 7.17. I also thought he would make a good whip - reminded me rather too much of the outwardly charming but inwardly ruthless Francis Urguhart from House of Cards (except that Urquhart would not have picked such public fights). Urquhart was an expert at leaking adverse comments about his opponents, using the media, in short doing what it took to further his political career. And he had a wife willing to support her husband no matter what. But that was until he got stuck in the loo - and the wrong loo at that - on his first day. And Mrs U would never, ever have made excruciatingly, toe-curling revelations about her husband in a broadsheet, never mind a tabloid. Thanks for your help agov and Janet. I'd found that discussion but I couldn't see my comment for looking! Thank you for these sensible words. I have no hopes for N Morgan as ed sec, but I suppose it is a small victory. Thanks Francis for the article. I only take dispute I think with the phrase "Mainstream media" - like many I have lost any sense of identity with the 'politicos' at this time living as you say in that bubble. The media also (as you also do say) live in the same bubble so do not feel that they are mainstream and they are overwhelmingly right wing. You only touch on teacher recruitment but this is another area where Gove's policies have been (and will be) disastrous. Teach First is a stunt, Schools Direct only works because it is being propped up by the universities - but for how long and we are facing a massive shortage of trained teachers. I agree fully with the end part of the article that the real worry now is TH. I mailed him and got the reply, "Should Labour come into power in 2015 we will inherit a very fractured landscape caused by Michael Gove’s relentless ideologically driven overhaul of the schools system. However, I do not believe that undoing every single reform will help teacher or students as it will cause more disruption" - I would like to hear him articulate what reforms they will undo. Teach First has become too big and successful to be written off as a stunt IMHO. It's now the biggest employer of fresh graduates in the country. Barry - Teach First may be "the biggest employer of fresh graduates in the country" (presumably you mean England) but quantity doesn't necessarily mean quality. They may be "fresh" but how many drop out either during training or shortly after the mandatory two years? And how many future "fresh" graduates will choose Teach First if the economy picks up and there are more lucrative jobs available? Durham Uni has evaluated Teach First but the evaluation has not been published. 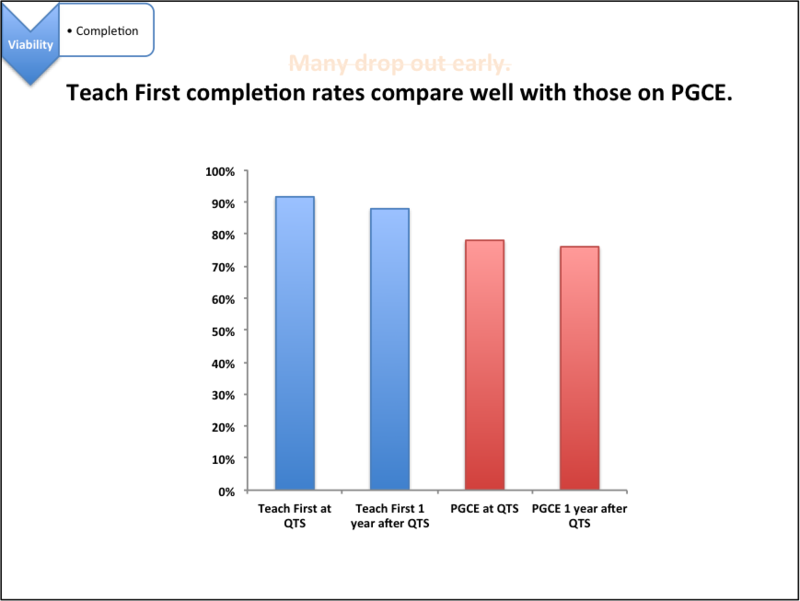 This suggests it found Teach First wasn't as successful as is claimed. Janet - Joe Kirby did a presentation at ResearchEd last year that showed Teach First outperformed PGCE both in terms of drop-outs and those still in teaching one year post-QTS. It also showed that with 7 applicants per place, TF was able to recruit the highest quality grads. In its 2011 inspection Ofsted graded Teach First as Outstanding in every one of the 44 criteria assessed. I can't see why you want to knock TF, frankly. Barry - then why hasn't the Durham evaluation been published? It appears Teach First gets preferential treatment and is more expensive (see here). Teach First was last inspected in 2011 but the regime has now been tightened up. I actually have no opinion on its effectiveness BUT I get a little suspicious of anything which receives acres of positive publicity while other methods don't. The Institute of London, for example, was found Outstanding for its initial teacher training but I don't recall the same praise being heaped on the university as is heaped on Teach First. And then, as I keep saying, there's the unpublished evaluation.